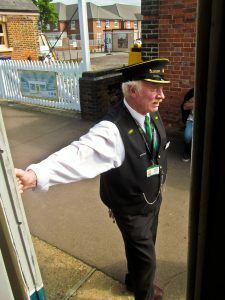 This post is, like modern trains, somewhat late but it does involve the trains of yesteryear and so is worth it, for the start of the month saw Heather and I visiting a preserved railway we’d barely heard of before, at Epping Ongar. The railway runs over what was the end of the Central Line in London, before it was cut back to finish at Epping Station. From the original terminus of Ongar the preserved railway runs through North Weald and out into the Epping Forest, to stop (at a picturesque but stationless point) just short of Epping and the tube. 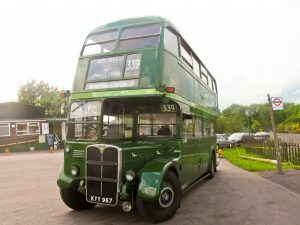 There’s an excellent shuttle service, provided by a fleet of vintage buses, between the still operational Epping tube station and North Weald station, the journey included in the price of admission (one day the railway hopes to run right up to Epping again and link in—it would certainly be a sight to see a big steam loco pulling into the little tube station!) They normally run a mixture of preserved steam and diesel but were having a steam gala weekend, complete with visiting locos, which seemed the ideal time to pay a visit. The weather when we set off for Epping-Ongar wasn’t particularly inspiring, heavily raining in fact, so that we found ourselves cowering just inside Epping station awaiting one of those buses. The weather began to change as we rode the short journey to North Weald though so that by the time we disembarked it wasn’t raining so badly. After taking an excited first look at the steam locos sat at the platforms we wandered around the little railway buffs market and tried to find some lunch. That turned out to be harder than expected, in a very disorganised buffet car offering. I eventually gave up on waiting for my bacon roll, and went to the gift shop instead. There we picked up the usual momentos and a couple of interesting books, including the lovely Isabel Finds A Home which Heather happily got dedicated by the author. By then the weather had improved to the point of nearly stopping raining, not that we cared, because there were trains to ride! 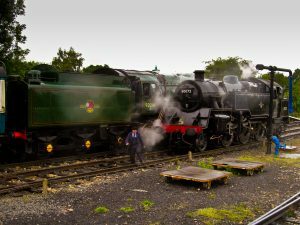 First up was a ride from North Weald to the end of the line at Ongar, behind the 4MT tank engine 80072, visiting from Llangollen Railway., a lovely little engine that comfortably took us up to the quite station at Ongar. 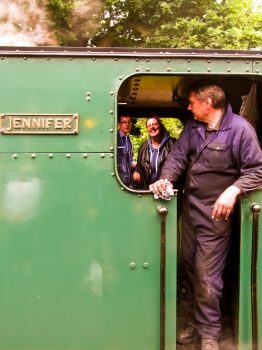 There we got to watch the shunting operations being performed by the little industrial tank engine Jennifer (also on loan from Llangollen), preparing the train for the return journey. We didn’t head straight back though, instead looking around the station building (another little shop, and snacks). The highlight though was the “driver for a fiver” experience offered, as first Heather and then I got a chance to actually drive Jennifer a short distance from the platform, out past the signal box and back (even if I couldn’t get her into reverse without some help). Heather made sure to not allow me to be talked into going up to volunteer though, or she might never see me! We got our driving in just in time for shortly afterwards the train arrived to take us away again. 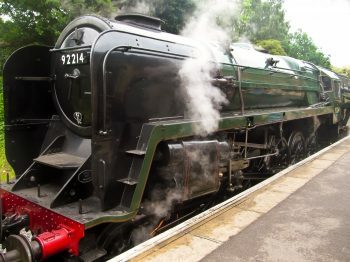 This time it was hauled by the visiting 92214, BR standard 9F resplendent in BR green, an impressive (and somewhat oversized for the location) sight. Having come down from The Great Central Railway she made short work of the trip back to North Weald and, after a brief pause for passengers and for 80072 to come round and take up the rear, out into the Epping Forest. As must be done on such occassions, especially with a steam loco working both front and rear, Heather and I spent most of the journey with our heads hanging out of windows. The train stops short in the middle of the forest, a point unmarked a stone’s throw from the still active tube station. Then it was back down through the forest again to North Weald. There we got off again for there was one loco we hadn’t been with still, another fine tank in 1744. So off into the forest we went again, 1744 leading the way with the 9F at the rear. A final journey back to North Weald finished the day in time to still catch a heritage bus back to the tube, and on home. 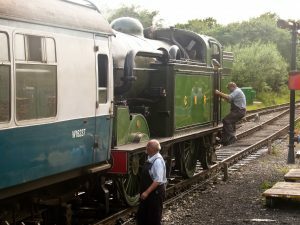 An excellent day out to a growing heritage railway which will hopefully go from strength to strength. The post Central Steam was first published on Saturday 2nd July 2016 at 3:31 pm .